The following utility generates an EAN-13 barcode, with detailed explanations provided below. EAN-13 is the global counterpart of the UPC, becoming the most widely used article identification number in the world. It is composed entirely of digits: the first 2 or 3 digits identify the country code, the next 5 digits are the manufacturer code, the next 5 digits are the product code, and the last digit is the checksum digit. The European article numbering barcode (EAN) was introduced in 1977, offering a set of coding rules to identify products, processes, shipments, companies and locations. In 2005 the organization joined forces with the Uniform Code Council (UCC)- the numbering organization in the USA (which, in that year changed its name to GS1 US), requiring that all retailers and trading partners in the US and Canada that presently scan the 12-digit UPC symbol be capable of scanning the EAN-13 symbol instead, in order to meet the standard used by the rest of the world, outside of the United States and Canada. 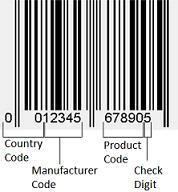 The country code indicates the country in which the bar code was assigned (not the country of origin of the product, which can be manufactured anywhere in the world). The "MO" abbreviation stands for Member Organization, set by the GS1 administration in a given country. The following number system list is maintained by the GS1 authority, found here. A company prefix that identifies the manufacturer. An item reference assigned by the manufacturer to differentiate the company’s items. The last digit of a bar code number, which makes sure the bar code is correctly composed, increasing the reliability of the received information. Note: The EAN barcode generator provided above will automatically correct the check digit. 2. Sum up the even numbers and the multiplied odd numbers. 3. Subtract the sum from nearest equal or higher multiple of ten. Step 3: The nearest equal or higher multiple of ten is 90. You may also be interested in the Multi-barcode generator.